This calculator will find the missing variable in the physics equation for gravitational potential energy, when three of the variables are known. Potential Energy is the stored energy of an object given its position relative to a body. Gravitational potential energy is one type of potential energy and is equal to the product of the object's mass (m), the acceleration caused by gravity (g), and the object's height (h) as distance from the surface of the ground (the body). 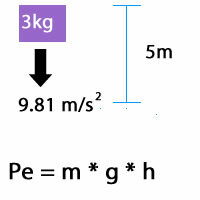 In this example, a 3 kilogram mass, at a height of 5 meters, while acted on by Earth's gravity would have 147.15 Joules of potential energy, PE = 3kg * 9.81 m/s2 * 5m = 147.15 J. 9.81 meters per second squared (or more accurately 9.80665 m/s2) is widely accepted among scientists as a working average value for Earth's gravitational pull. This figure is based on a measure of gravity at sea level at a latitude of 45°. At higher altitudes, gravity decreases slightly. The effect of latitude on gravitational force is relevant as gravity increases with increasing distance from the Equator. At the Equator, the Earth's gravity is 9.780 m/s2 and at the poles it is 9.832 m/s2 (source: CRC Handbook of Chemistry and Physics). Furey, Edward "Gravitational Potential Energy Calculator"; from https://www.calculatorsoup.com - Online Calculator Resource.